Future perfect tense definition: The future perfect tense expresses action that will be finished at some point in the future. The future perfect tense indicates actions that are complete, or finished. These actions have not yet occurred but will occur and be finished in the future. The future perfect tense is used to express a few different situations. When he leaves, they will have finished the movie. This summer, I will have been playing volleyball for four years. Let’s look at some additional examples to understand the uses of the past perfect tense. By the time you finish dinner, I will have finished dessert. Tomorrow, he will have run the race. When my father arrives, I will have been ready to leave for twenty minutes. These examples indicate actions that have not yet occurred. These actions will happen in the future. These actions will also be finished, or complete at some point in the future. I will have been working for two hours by the time you wake up. Next month, we will have been dating for two years. When you visit Santa Barbara, I will have lived there for three years. In September, my best friend will have served as a librarian for twenty years. The baby will have been walking for one month on her first birthday. These examples indicate actions that are currently occurring AND will continue to some point in the future. There are two other primary perfect tenses: the present perfect and past perfect. She has traveled to the Galapagos Islands. We have worked together since 1997. 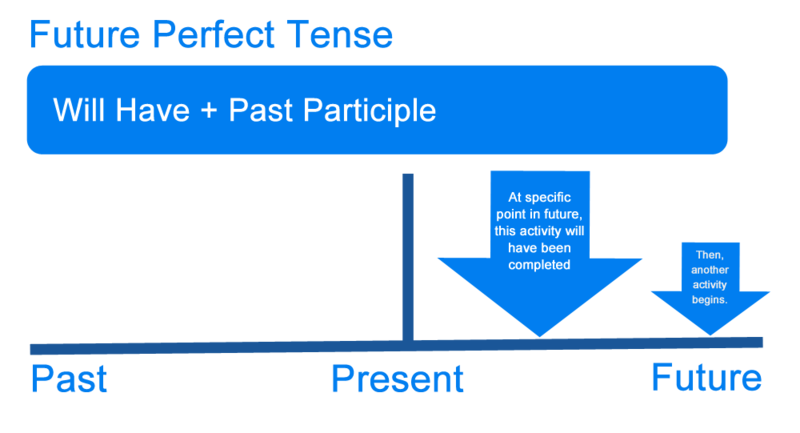 What is the past perfect tense? The past perfect tense most often expresses actions in the past that finished before another action (also in the past) started. After we had arrived in Hawaii, we were able to relax. We had worked for years without vacationing. If we had arrived safely in Hawaii, we would have been able to relax. He called to ask if we had arrived. I wish I had relaxed on vacation. Define perfect future tense: the definition of perfect future tense is the tense denoting an action that will be completed before another specific future time or future action. 1 What is the Future Perfect Tense?